Some patterned papers are absolutely gorgeous, but also full on. The key to incorporating such papers in your layouts is to tone them down by using only sections of the design. This layout shows you how to ensure your photos are not lost in the background and draw attention to the beauty of your paper. 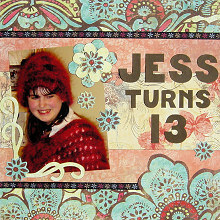 This layout was created using Fancy Pants Wildheart Blossom Paper, Fancy Pants Free Spirit Meadow Paper, dark brown cardstock, a 12x12 sheet of cardstock (the colour doesn't matter as it will be covered), a dark coloured ribbon, dark brown ink and a red glitter pen. Use a 12x12 sheet of cardstock for your background. This will be completely covered over so any colour will do. Place your Fancy Pants Wildheart Blossom Paper in front of you with the white strip at the bottom. Cut a horizontal strip approximately 5cm tall from the top of the paper. Adhere it horizontally across the top of your page. Cut another 5cm strip from the bottom of the same paper, but do NOT cut all the way across. Instead, when you reach the flower, cut around it's edges. See the layout above to make sure you are cutting the right place. Set aside. Place your Fancy Pants Free Spirit Meadow Paper in front of you with the white strip at the bottom. Turn it face down. You will notice that the design on the back goes all the way to the bottom of the sheet (in other words, there is no white strip on the back). Cut a strip approximately 21cm tall from the bottom of the paper. This will leave you with another strip approximately 10.5cm tall. Adhere the large piece to your background directly underneath the first strip. Make sure the pinkish side is face up. Place ribbon across the join and glue in place. Turn the small piece of Meadow paper over so you are looking at the front (the yellow side). Ink the top and bottom edges with dark brown ink. When dry, adhere in the middle of the pink piece. Adhere your last strip of Blossom paper along the bottom of your page. DO NOT adhere the section with the cut-out flower shape. Adhere ribbon on top of the join between the Blossom paper and Meadow paper, tucking the end behind the flower, as shown in the layout above. Angle a 5x7 photo on the right side of your page, as shown above, and glue in place. Cut your title from dark brown cardstock and glue next to your photo, as shown above. From your remaining Blossom paper, cut out five flower shapes from the pattern. Set them aside. Using the template found here, cut out a large blossom shape from the Blossom paper. You may wish to alter the size of the template. Outline the edge with a red glitter pen. Cut a second, smaller blossom shape from the underside of the Blossom paper. Ink the edges of the second blossom with dark brown ink. Set aside all your flowers. Use the underside of the Blossom paper to cut two scroll shapes for the bottom left corner of your photo. You can draw them yourself or use a template. Ink the edges with brown ink and glue in the bottom left corner of your photo, as shown in the layout above. Cover the join with one of the flowers you cut out. Arrange the rest of your flowers as shown in the layout above and adhere. Finally, use your red glitter pen to accent the centre of your flowers. You may also like to use it to accent the red sections of the large flower in the bottom right corner of your page to give your layout extra sparkle.